If you're sick and tired of doing all the marketing and advertising on your own...Discover how you can make maximum profits with minimum effort by getting other people to willingly market for you! Unlock the secrets to getting other people to talk about you and your business willingly whether they're paid to do it or not! As the name itself is self-implied, you'll do more than well to leverage on Viral Marketing to have the word spread out about your product or service online. 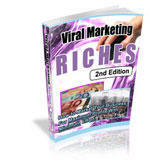 And what rewards can Viral Marketing bring you?